Newgrange is situated a few miles North of Dublin in Ireland. It is described as a passage-tomb or ancient temple and dates from the Neolithic period – this makes it over 5000 years old, older than Stonehenge and the pyramids of Giza. The temple is a large circular mound with a passageway and chambers inside. The mound is ringed by 97 large kerbstones, some of which are decorated with geometric carvings. For the majority of the time it is completely dark inside the temple but on a few days of the year, around the Winter Solstice, the sun’s rays at dawn shine along the interior passageway and light up the central chamber. I visited Newgrange several years age while on holiday in Ireland and found the site fascinating, particularly the precise alignment of the entrance with the rising Winter sun. This was the first thing I thought of when I knew that the theme of this month’s piece was to be “Entrance”. 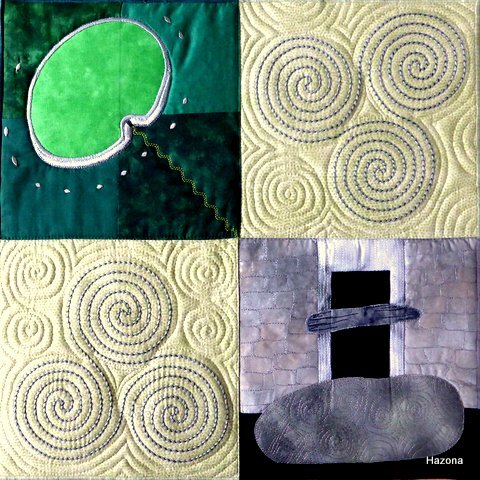 My Newgrange quilt features several images from the temple. Top left is an aerial view of the site including the temple and the remaining stones of its outer circle. Bottom right is the entrance to the temple with one of the large, decorated kebstones that lies in front. The other two sections of the quilt reflect some of the geometric carvings on the kerbstones. The quilt is made entirely from cotton – all fabrics (some commercial, some hand painted), threads and waddings. 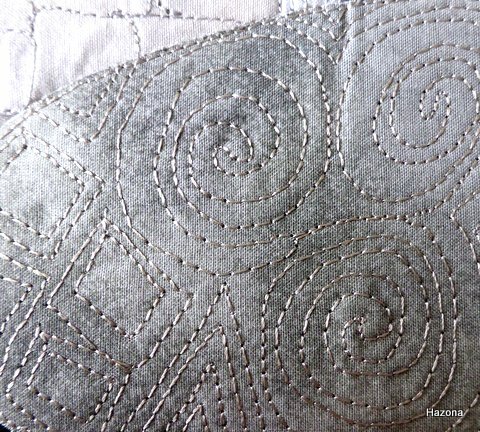 I have used piecing, appliqué and free motion quilting. Oooh! I really like places like Newgrange! I was blessed to be able to visit Stonehenge in the early ’70s when you could still walk around it and touch the stones. I’d be fascinated with Newgrange, I’m sure. The haunting entrance, the spiral engravings…Wow! Thanks for rendering this so beautifully and sharing this unique ‘entrance’ with us. Beautiful interpretation ! I’ve always been attracted by sites like this one and had visited one in Brittany in France ! I love how you have chosen to represent the site. I love the calm and regularity of this piece….A great representation. This quilt is fascinating, combined with your explanation of New Grange. I just wish I had known of its existence on our fleeting visit to Dublin. I am always in awe of the craftsmen of that time, with their skill to set out such a site, without the benefit of the modern electronic devices we have today. 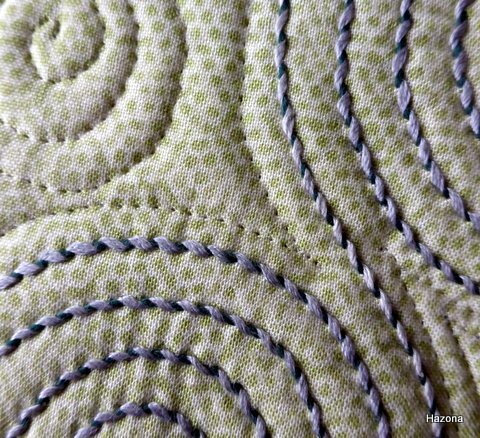 I love your perfect swirls and stitching too.